Dayton Canyon lies less than a mile downhill from the former Rocketdyne lab’s eastern border. 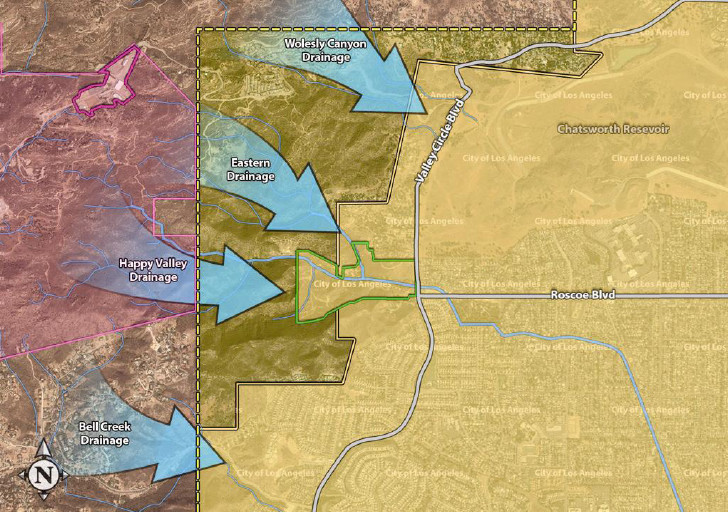 Centex Homes hopes to build a development here despite high readings of perchlorate that the company insists couldn’t possibly have come from the Santa Susana Field Laboratory. One hundred and fifty single-family homes are planned on 64.2 acres out of the development’s 359.4 total acreage. Dayton Creek runs through the project and is fed by Rocketdyne’s Happy Valley drainage, which has undergone massive excavation due to perchlorate contamination. On May 28, 2004, the Centex-Sterling Homes Company bought over 355 acres west of Valley Circle Boulevard at Roscoe Boulevard. The 151 new homes will be approximately 3,500 square foot, two-story residences on 10,000 square foot lots, some within ten feet of Dayton Canyon Creek. The amount of contamination found has been astronomical. After a May 2005 article in the Los Angeles Daily News appeared questioning why the developers had never tested for toxins despite being just 1.3 miles downhill from the lab, Centex Homes finally did test and found up to 62,000 parts per million of the rocket fuel oxidizer perchlorate in the sediment along Dayton Canyon Creek. These are absolutely immense concentrations. We could not have disagreed more. Common sense dictates that perchlorate, a solid rocket fuel used in huge amounts at SSFL just up Dayton Creek from the proposed housing development, would be logically the source of the Centex development’s contamination. 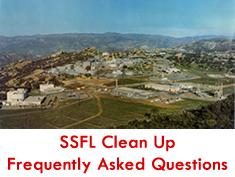 Perchlorate was used at SSFL, there was extensive contamination with perchlorate at SSFL, and much of that contamination at SSFL was in “Happy Valley” at the headwaters of Dayton Creek, which flows through the proposed development and in which the perchlorate was found. 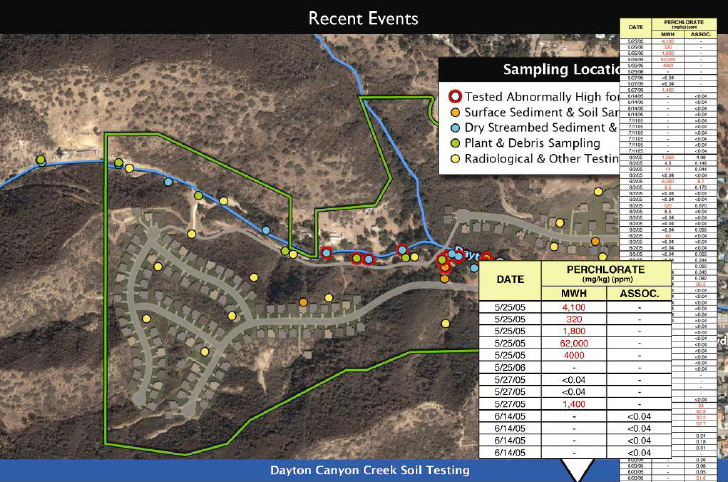 “Cesium-137 was found in the Dayton Canyon West area at levels on average twice that of local background,” according to Dan Hirsch of the Committee to Bridge the Gap in a November 13, 2006 report called Radioactive Contamination at Dayton Canyon from the Santa Susana Field Laboratory — Comments on Radiological Monitoring. CBG’s report is must reading for folks concerned about this proposed development west San Fernando Valley development just below Rocketyne. Even though the current recession seems to have made the viability of any kind of upscale housing development tenuous at best, let alone one beset by the problems this one has faced, the issue remains alive. RCC will continue to vigilantly monitor Dayton Canyon to keep you informed of this issue.